There have been a lot of big, long-term announcements in the world of superhero movies of late, with a deluge of planned movies featuring caped crusaders and vile villains flooding the news. It’s become increasingly common, as studios seek to build long-ranging, profitable franchises, to see plans for film sequels (and even sequels to as-yet unreleased sequels) slotted into these elaborate long-term schedules, and it can all get a little tricky to keep track of. Which Avengers spin-off will be coming out in 2019? Will the 2018 Batman movie be Lego or live-action? Luckily, graphic designer Dylan Todd, working over at the Comics Alliance, has put together a handy chart to help you put your movie-going life in order. Blockbuster season having passed, the only superhero film left in 2014 is Disney’s colorful, comedic Big Hero 6, which comes out November 7. 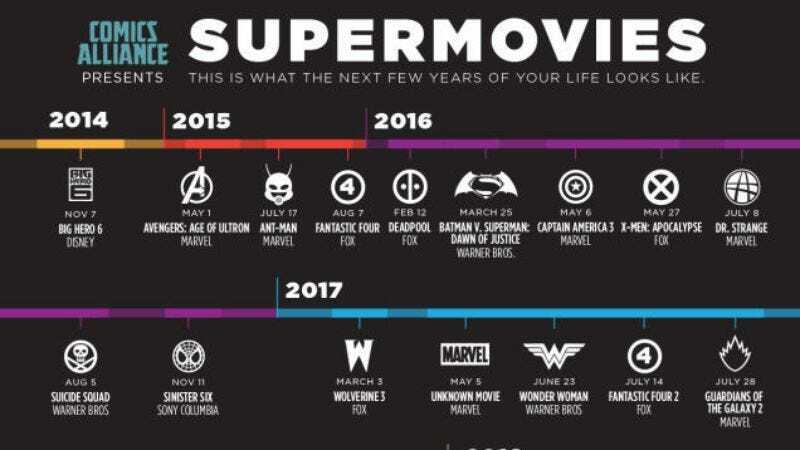 Looking past that, though, the schedule fills up, with 2016 seeing at least seven new supermovies from Fox, Marvel, and Warner Bros, and even more planned through the rest of the decade. It’s all enough to make supervillains quake with fear, and movie execs salivate from all the potential profits. Comics Alliance’s Andrew Wheeler has put together some analysis of the schedule as well, noting, for instance, that only two of the 29 projects with known release dates star women in solo lead rolls—2017’s Wonder Woman, and one of Sony’s as-yet-untitled Spider-Man films. You can read more of Wheeler’s analysis here.